Henry put a bolt through the hole and screwed a nut onto the end to fasten it. The door is secured with a lock and two bolts. Neil turned the key and heard the bolts draw back. The prisoner's bolt for the open door took the guards by surprise and he almost got away. Leah always bolts her front door at night. The frightened cat bolted behind the couch. Tom decided to bolt the Republicans and vote for the Democrats. In a rush to go out, Olivia bolted down her dinner. Bolt dates back to before the year 1000. Bolt (the spelling remains unchanged since then) originally meant ‘a short arrow with a heavy tip,’ as well as ‘a crossbow to shoot these arrows.’ It can be traced back to the Proto-Germanic bultas, and further back to the Proto-Indo-European root bheld- (to knock or strike). 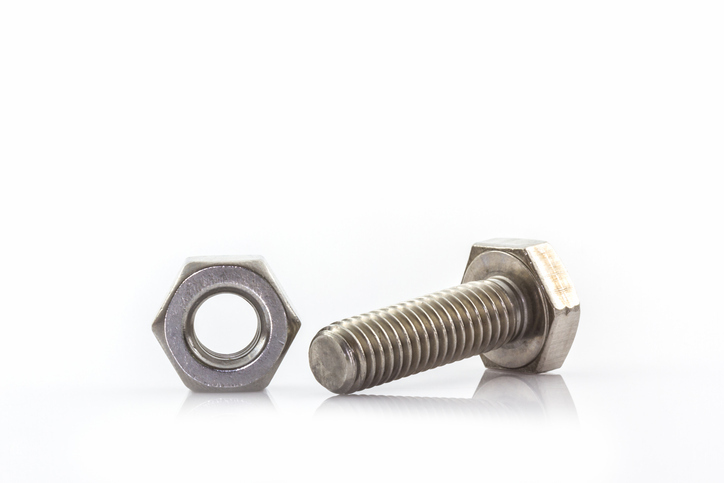 It is related to the Old Norse bolti, the Danish bolt, the Dutch bout and the German Bolz, all meaning ‘bolt.’ The sense expanded in Middle English to other short metal rods (especially when they had knobs at the end). A bolt of cloth took this name due to its long, narrow shape, and dates back to around the year 1400. Meanwhile, thunderbolt dates back to the mid-15th century, and lightning bolt to the early 16th century. Both are figurative senses related to the quick sharp flight and strike of an arrow. The verb comes from the noun and, meaning ‘to pring or make a quick start,’ dates back to the early 13th century. The sense ‘to lock or secure using a bolt’ is from the late 16th century, while the sense of leaving suddently is from the 19th century, a figurative sense related to runaway horses. To bolt down food dates back to the late 18th century.